The AGM-65 Maverick is an air-to-ground missile (AGM) designed for close air support. It is the most widely produced precision-guided missile in the Western world, and is effective against a wide range of tactical targets, including armor, air defenses, ships, ground transportation and fuel storage facilities. Development began in 1966 at Hughes as the first missile to use an electronic contrast seeker. It entered service with the United States Air Force in August 1972. Since then, it has been exported to more than 30 countries and is certified on 25 aircraft. The Maverick served during the Vietnam, Yom Kippur, Iran–Iraq, and Persian Gulf Wars, along with other smaller conflicts, destroying enemy forces and installations with varying degrees of success. Since its introduction into service, numerous Maverick versions had been designed and produced using electro-optical, laser, and imaging infrared guidance systems. The AGM-65 has two types of warhead: one has a contact fuze in the nose, the other has a heavyweight warhead fitted with a delayed-action fuze, which penetrates the target with its kinetic energy before detonating. The missile is currently produced by Raytheon Missile Systems. The Maverick's development history began in 1965, when the United States Air Force (USAF) began a program to develop a replacement to the AGM-12 Bullpup. With a range of 16.3 km (8.8 nmi), the radio-guided Bullpup was introduced in 1959 and was considered a "silver bullet" by operators. However, the launch aircraft was required to fly straight towards the target during the missile's flight instead of performing evasive maneuvers, thus risking the crew. Even when it hit, the small 250 pounds (110 kg) warhead was only useful against small targets like bunkers, when used against larger targets like the Thanh Hóa Bridge it did little other than char the structure. The USAF began a series of projects to replace Bullpup, both larger versions of Bullpup, models C and D, as well as a series of Bullpup adaptations offering fire-and-forget guidance. Among the later were the AGM-83 Bulldog, AGM-79 Blue Eye and AGM-80 Viper. The most modern versions of the Maverick are the AGM-65H/K, which were in production as of 2007[update]. The AGM-65H was developed by coupling the AGM-65B with a charge-coupled device (CCD) seeker optimized for desert operations and which has three times the range of the original TV-sensor; a parallel USN program aimed at rebuilding AGM-65Fs with newer CCD seekers resulted in the AGM-65J. The AGM-65K, meanwhile, was developed by replacing the AGM-65G's IR guidance system with an electro-optical television guidance system. Different models of the AGM-65 have used electro-optical, laser, and imaging infrared guidance systems. The AGM-65 has two types of warheads: one has a contact fuze in the nose, the other has a heavyweight warhead fitted with a delayed-action fuze, which penetrates the target with its kinetic energy before detonating. The latter is most effective against large, hard targets. The propulsion system for both types is a solid-fuel rocket motor behind the warhead. In June 1975, during a border confrontation, a formation of Iranian F4E Phantoms destroyed a group of Iraqi tanks by firing 12 Mavericks at them. Five years later, during Operation Pearl as part of the Iran–Iraq War, Iranian F-4s used Mavericks to sink three Osa II missile boats and four P-6 combat ships. 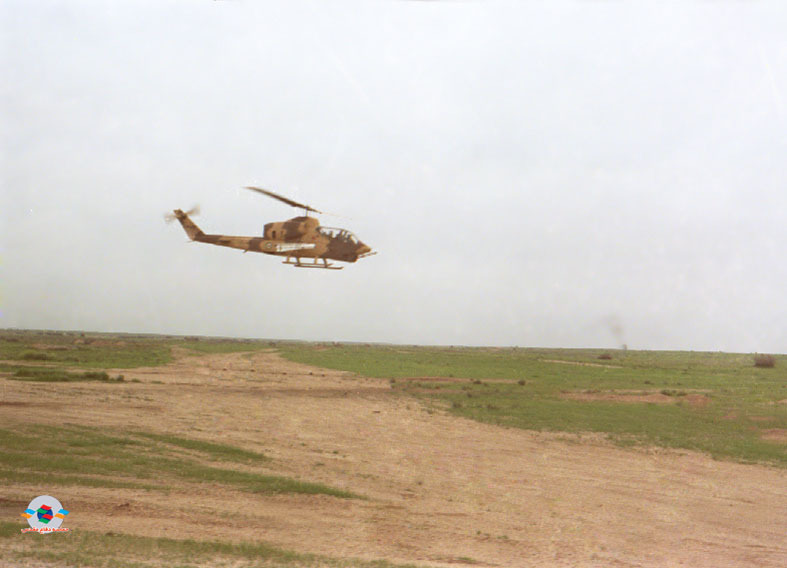 Due to weapons embargoes, Iran had to equip its AH-1J SeaCobra helicopters with AGM-65 Maverick missiles and used them with some success in various operations such as Operation Undeniable Victory wherein Iranian AH-1Js fired 11 Mavericks. In August 1990, Iraq invaded Kuwait. In early 1991, the US-led Coalition executed Operation Desert Storm during which Mavericks played a crucial role in the ousting of Iraqi forces from Kuwait. Employed by F-15E Strike Eagles, F/A-18 Hornets, AV-8B Harriers, F-16 Fighting Falcons and A-10 Thunderbolt IIs, but used mainly by the last two, more than 5,000 Mavericks were used to attack armored targets. The most-used variant by the USAF was the IIR-guided AGM-65D. The reported hit rate by USAF Mavericks was 80–90%, while for the USMC it was 60%. The Maverick was used again in Iraq during the 2003 Iraq War, during which 918 were fired. According to the article on Kh-23 Grom the guidance system of the Serbian Grom-B is based on the Maverick system. ^ Laur and Llanso claim that 18 Mavericks were launched for 13 hits during the Vietnam War from January to February 1973, while the Israelis launched 50 Mavericks during the Yom Kippur War for 42 hits and five deliberate misses. ^ a b c d e f g h i j k l m "AGM-65 Maverick". United States Air Force. 16 November 2007. Archived from the original on 2013-08-01. Retrieved 19 December 2011. ^ a b c d e f g h i j k l m n o p q r s "Raytheon (Hughes) AGM-65 Maverick". Designationsystems.net. 7 April 2005. Archived from the original on 2013-10-04. Retrieved 19 December 2011. ^ a b c d Bonds & Miller 2002, p. 230. ^ a b c "AGM-65 Maverick" (PDF). Raytheon. 2001. Archived from the original (PDF) on 2013-11-04. Retrieved 22 December 2011. ^ a b "AGM-65 Maverick" (PDF). Raytheon. 2007. Archived from the original (PDF) on 2012-07-28. Retrieved 22 December 2011. ^ Lambeth, Benjamin (2000). The Transformation of American Air Power. Cornell University Press. p. 39. ISBN 0801438160. ^ a b c d e f g "Maverick: smarter than average". Flight International. 23 November 1972. Archived from the original on 2013-11-05. Retrieved 20 December 2011. ^ "Maverick Under Control". Flight International: 582. 9 October 1969. ^ a b c d e f g h i j k l m n Friedman 2006, p. 562. ^ a b Clancy 1995, p. 166. ^ a b c Lewis, Paul (30 April – 6 May 2002). "Raytheon considers turbojet as part of Maverick missile upgrade package". Archived from the original on 2014-04-08. Retrieved 21 December 2011. ^ Clancy 1995, pp. 163–164. ^ "Air-to-ground: Hughes AGM-65 Maverick". Flight International. 2 August 1980. Archived from the original on 2013-11-05. Retrieved 20 December 2011. ^ Laur & Llanso 1995, pp. 273–274. ^ Laur & Llanso 1995, p. 274. ^ "Operation Morvarid". Iinavy.org. Archived from the original on 2012-02-11. Retrieved 22 December 2011. ^ a b c d e f g h Elliott, Simon. "The Missiles That Worked". Flight International. p. 38. Archived from the original on 2014-04-08. Retrieved 20 December 2011. ^ a b U.S. 6th Fleet Public Affairs (31 March 2011). "Navy Firsts During Odyssey Dawn". United States European Command. Archived from the original on 2014-04-09. Retrieved 20 December 2011. ^ a b c d "LAU-117 Maverick Launcher". FAS Military Analysis Network. 23 April 2000. Archived from the original on 2014-04-08. Retrieved 21 December 2011. ^ "F/A-18 fact file". United States Navy. 13 October 2006. Archived from the original on 2014-01-11. Retrieved 21 December 2011. ^ a b c d e f g h i "Hughes AGM-65 Maverick". Flight International. 5 February 1983. p. 324. Archived from the original on 2014-04-08. Retrieved 21 December 2011. ^ a b c d e f g "AGM-65 Maverick Tactical Air-Ground Missile, United States of America". Airforce Technology.com. ^ Karim 1996, p. 71. ^ "Technical Specifications: CF-188 Hornet". Airforce.forces.gc.ca. 26 March 2007. Archived from the original on 2011-01-05. Retrieved 21 December 2011. ^ "L-159 calls the shots in Norway". Flight International. 23–29 June 1999. Archived from the original on 2014-04-08. Retrieved 21 December 2011. ^ "Indonesia – AGM-65K2 MAVERICK Missiles". Defense Security Cooperation Agency. 22 August 2012. ^ "次期固定哨戒機（XP-1）性能評価を実施中". Technical Research and Development Institute. June 2012. Archived from the original on 4 March 2016. ^ "Malaysia asks for more F-18s". Flight International. 14–20 September 1994. Archived from the original on 2014-04-08. Retrieved 21 December 2011. ^ "Australian navy makes avionics software deal". Flight International. 20–26 February 2001. Archived from the original on 2014-04-08. Retrieved 21 December 2011. ^ "Kahu Skyhawk fires Maverick". Flight International. 13 May 1989. Archived from the original on 2014-04-08. Retrieved 21 December 2011. ^ "NZ sells soon-to-be retired Seasprites to Peru". Australian Aviation. 22 December 2014. ^ "FA-50PHs Now Armed with Air-to-Ground Missiles". 4 July 2017. ^ Jon Lake (16 May 2012). "Small force that has wealth of experience". Arabian Aerospace. ^ Hoyle, Craig; Hasharon, Ramat (14–20 December 2004). "UK considers decoy for Harriers". Flight International. Archived from the original on 2014-04-08. Retrieved 21 December 2011. Bonds, Ray; Miller, David (2002). "AGM-65 Maverick". Illustrated Directory of Modern American Weapons. Grand Rapids, Michigan: Zenith Imprint. ISBN 978-0-7603-1346-6.